Standard rooms with a floor area of 12–35m2 and one to four beds. 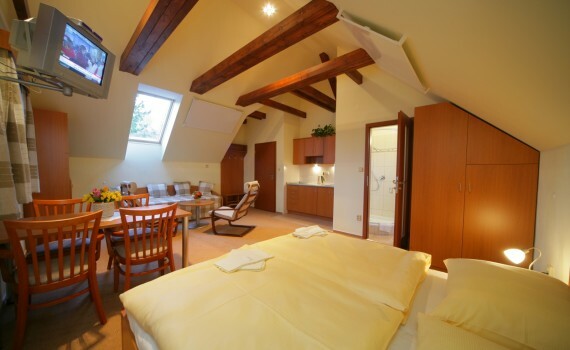 Above-standard rooms – attic – Superior and stylish suites with kitchenettes in a separate house next to the main building. Both types have a floor area of about 30m2. All rooms have their own sanitary facilities (shower, toilet), a television with satellite reception and free wireless Internet access. In the standard category there are also economy suites with four bedrooms, without a kitchenette and with a shared bathroom and toilet.